April 2017: 30-year-old Debi Ghose – best known by her DJ name DEBONAIR – surveys the huge crowd in front of her in the cavernous space of Tate Modern’s Turbine Hall and permits herself a smile. ‘It was definitely one of the standout gigs of my career,’ Ghose remembers of the evening she spent playing rare cuts to 10,000 people in one of London’s most high-profile cultural institutions. The night was part of an event curated by NTS, an online radio station that broadcasts from a sticker-covered hatch in Dalston’s Gillett Square. 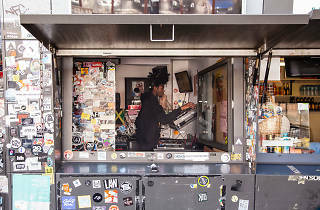 A resident DJ on NTS since it began in 2011, Ghose has gone from getting booked by a listener to playing Panorama Bar (situated atop Berlin’s legendary Berghain club – the DJ equivalent of entering Valhalla). Her ascendancy runs in parallel with the growth of the station that helped accelerate her already-burgeoning career. But Rinse wasn’t alone for long. A new breed of radio shows, broadcasting online and on community stations, has arrived to shape our capital. And while numbers of stations don’t yet match the hundreds of pirates that used to exist in London, it’s a hint of exciting things to come. Hackney’s NTS now has more listeners than almost all online radio stations worldwide, even outranking commercial stations like Capital Xtra. It’s expanded internationally, opening studios in Manchester, Shanghai and LA.